In a career spanning 50 years, Mark Stein has been responsible for some of the most legendary sounds in Rock history. After earning acclaim with the great Vanilla Fudge in the late ’60s, he continued an incredible sonic journey that saw him work with the likes of Alice Cooper, Dave Mason, Carl Palmer and the late Tommy Bolin of Deep Purple. A true artist who shows no signs of slowing down, he recently launched a new band, The Mark Stein Project, which makes its worldwide debut tonight at the BB King Blues Club & Grill in New York City. Other upcoming shows include February 1 at Daryl’s House in Pawling, NY and February 2 at the Bull Run in Shirley, MA. Stein discusses his new group - and a few important figures from his past - in the following interview. We could probably spend hours talking about various things in your career, but let’s start with the here and now. What led to this current band you’re doing and the selection of the players you have for this thing? Vanilla Fudge, over the last 18 months to two years, really haven’t been doing a lot of shows. I was speaking with Robbie Krieger from The Doors on the phone; he was out doing his own band. We were talking, and I said, ‘You know, maybe I should try to put my own band together.’ I started thinking about it, and I called my friend Margo Lewis from TCI [Talent Consultants International] and said, ‘Why don’t you help me try to put this together? I think it could work.’ One thing led to another. It’s called The Mark Stein Project, and it’s a really a tribute to Classic Rock and all of the artists that I’ve been lucky enough to play with throughout my career. 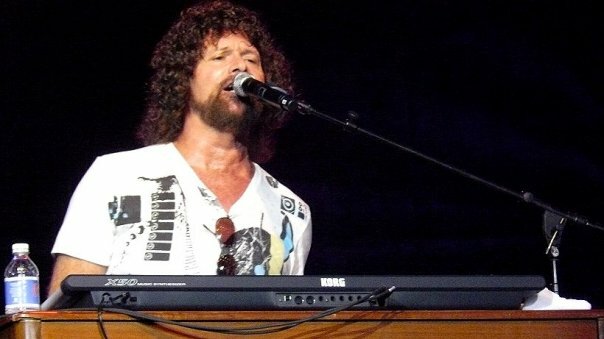 It’s mot just the fact that I’m the lead singer, keyboardist and arranger of Vanilla Fudge. I toured with Alice Cooper for the Welcome To My Nightmare show in the Southern Hemisphere back in the ‘70s. I also played with Dave Mason in his heyday in the late ‘70s during the ‘We Just Disagree,’ big-hit time, and I wrote a lot of songs with Dave. I also played with Tommy Bolin; when he left Deep Purple, he put a great band together. We had a terrific Rock Fusion band, and I played on his last album, Private Eyes. In 2017, I played with Carl Palmer from Emerson, Lake & Palmer. We did a handful of shows; I did a guest appearance on a tribute to the late, great Keith Emerson – and after that, [we lost] Greg Lake, unfortunately. I’ve appearance with The Doors, and I’ve made appearances with Deep Purple and just so many people. The night is songs from all of the bands I’ve played with. I’m also doing an original tune I wrote called ‘Let’s Pray For Peace,’ which is getting pretty popular around the world. I’ve got a great drummer, Charlie Z. [Zeleny], who’s played with Jordan Rudess from Dream Theatre, Joe Lynn Turner from Deep Purple and a whole bunch of people. I’ve got a young cat named Jordan Steinberg, who’s a really great bass player and a terrific vocalist as well. I have a cat by the name of Mark Hitt on guitar; a lot of people know him from the New York area from a band called Rat Race Choir. He’s played with John Entwistle [from The Who] and Robin Zander from Cheap Trick and Brian Johnson from AC/DC – just a whole bunch of people. This is a really cool combination of young and seasoned pros. Considering all the artists you just named in terms of folks you’ve played with, what is the level of difficulty in trying to figure out which key songs to incorporate into what you’re doing live? I’m basically doing the songs that I think are really popular with the audience and some songs that I love. ‘We Just Disagree’ was one of my favorite Dave Mason songs; it used to go over so great back in the day with the harmonies and the way we were doing it. We’re going to be be doing that song. ‘School’s Out’ is an Alice Cooper classic; we played that in front of thousands and thousands of people, and they freaked out over it. It’s just a great rocker. I’ve got my own approach to the song; I’ve got some really cool, different kinds of arrangements that I think will be really cool. It’s going to be a lot of fun. From the Carl Palmer experience of 2017, we’re going to be doing ‘Knife Edge.’ We’re going to do ‘You Keep Me Hangin’ On,’ the iconic arrangement from Vanilla Fudge, and then the psychedelic, slowed-down version of ‘Season Of The Witch.’ There’s going to be a lot of energy, a lot of dynamics and a lot of fun. You mentioned Tommy Bolin. In many ways, he’s an artist who – even 40-plus years later – doesn’t get the recognition he deserves for his time here. You were part of that final album; when you look back at that period, what stands out for you most in terms of working with Tommy on that particular project and where he was at that stage of his life and career? Tommy was an amazing talent. He was gone at 25; he just couldn’t overcome his demons, unfortunately. Many people who were close to him, including myself, tried. This was ’75 I think; I was pretty much a kid myself at 26. He was just a terrific songwriter, not just a great guitar player. His style of playing was just so fresh and different. We blended really well together. Narada Michael Walden from the Mahavishnu Orchestra was the original drummer in that band, along with Reggie McBride, the really cool bass player from Stevie Wonder’s band back then. We had Norma Jean Bell, the great and sax player from Frank Zappa’s band. It was a real eclectic group of musicians, and we rocked the house. A lot of Progressive musicians like John McLaughlin and Jan Hammer – and a whole host of people – used to get drawn to this band. It was short-lived, but it sure had a lot of energy. I can’t imagine where he would have been if he was still with us as far as a writer and a player. That was a great loss. As far his legacy, I disagree; I think his legacy is pretty strong. You’ve got a legion of Tommy Bolin fans; the remains of his family keep everything alive with Tommy Bolin Fests every year in the Midwest. I’m constantly seeing it and commenting on Tommy Bolan events on Facebook and other stuff going on in the internet. For somebody who was only around such a short time, I think he left a pretty decent legacy, actually. You mention that Tommy had his demons during that time, and I know Alice has been very open about that particular time in the late’70s when he was having his ups and downs. How would you characterize him during the time you were working with him? I’ll tell you, back in ’77 when I did the Welcome To My Nightmare tour in Australia and New Zealand, he was deep into those problems. I’m not going to get specific, but we pulled it off; the shows were great with great production. He was one who overcame it, and he went on to live a great life. He’s still doing fantastic. He’s a great guy – a real regular guy off the stage. Every time we’ve run into each other over the years, he’s always made time for me, which I really appreciate. He’s a tremendous performer and one of the true icons of Rock. No question. I interviewed your Vanilla Fudge bandmate Carmine Appice a few months ago, and we talked about a lot of things including the fact that Vanilla Fudge is at least 50 years into it. After so many years, what is it about working with Carmine and [guitarist] Vince [Martell] in 2018 that is still something that continues to attract you all together to make the band an ongoing reality? First off, we’re doing the Rock Legends Cruise with Sammy Hagar, my friends from Blue Öyster Cult and Bad Company and a whole bunch of great people this February 15-19. To answer to your question, we’re like brothers who fight and yada yada, break up and get back together, but we’ve just always had a natural chemistry together. When we hit the stage, me and Carmine are just great together, and Vince Martell fits right in there like a glove as well. We started out when we were just teenagers, and we’re still doing it today. It’s a mature energy [now], but it’s a great energy on stage. You can feel it from the people, and it’s the people who keep us going and vice versa. I hope it goes on a long time yet. It’s still a trip. It’s always interesting to me to talk with an artist who’s been around for many decades, because you’re clearly someone who’s seen the music industry change and evolve – and devolve, in some cases. The landscape in 2018 is so vastly different than what it was 20 or 30 years ago. Because you have remained active and are still working within the industry, what do you see as some of greatest advantages and disadvantages of the way the music industry seems exist in the here and now? Well, the advantage is the sound, first of all. Most of the venues have a great sound. Back in the olden days, a lot of the sound wasn’t developed yet; we didn’t really have monitors, and we didn’t great mixing. They didn’t have the elaborate boards that they have today. As far as disadvantages, the only thing I can say is the lack of enough gigs, because we really love to work a lot. The music industry is funny place where a lot of people don’t last 50 weeks, let alone 50 years. We’re talking about your new project and your music, so things are obviously moving forward for you. This isn’t the easiest profession in the world. What drives you to keep moving forward after so many years? What does doing this still provide you that you couldn’t find walking away and finding another line of work? The fans, the friends and the family. It just keeps you going. There have been a lot of times in my life and career when I felt like I had enough. I’ll have a little bit of a down period, and then the creative process will just come into my brain and I’ll start arranging sounds and thinking more about music. I’ll start writing songs, and I’ll want to start recording again. One thing leads to another, and I’ll start talking to musicians and agents. You just keep yourself involved, you know? It’s something I was just born to do. It’s in the blood. *Portions of this interview were edited for clarity.